This week is our Ada Mae sailboat challenge! The top 5 participants who turn in the most money between Monday, August 12th and Friday, August 16th are invited (along with a guest) to enjoy a sailboat ride on Friday of event weekend! 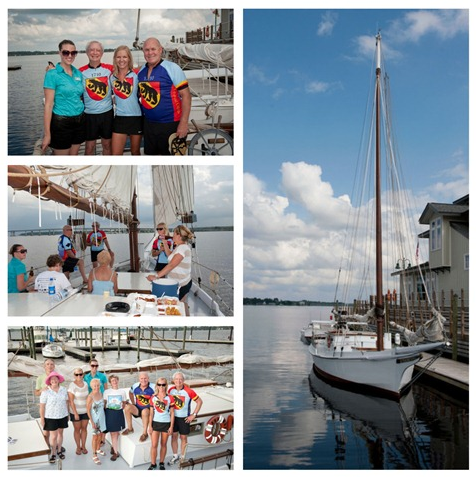 Your voyage will include, hors d'oeuvres, drinks, great company, and the most beautiful views of New Bern by water. *Special thanks to Ben Bunn and the crew at Carolina Coastal Classrooms for making this excursion possible. Here is your chance to win your very own Jack Kane custom racing bicycle! 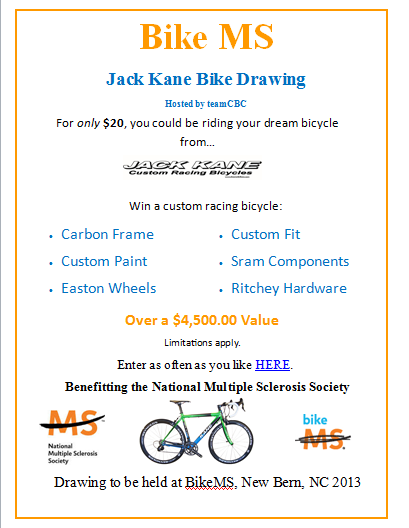 Team CBC is hosting the Jack Kane Bike Drawing and the winner will be annouced at Bike MS: Historic New Bern Ride. Thank you to our wonderful 2013 sponsors! Contact us at: http://www.nationalmssociety.org/ or 1-800-344-4867.
to receive our emails, please add us to your address book.